An often overlooked fact: filling a pool with ‘bad’ tap water will create ‘bad’ pool water so if you don’t know what sort of contaminants or issues your source water has, then you may very well set yourself up for failure if you blindly add it to your pool! 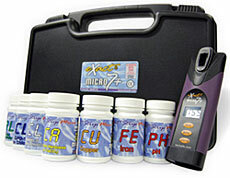 With that said, please check out the products offered in our Water (Quality) Test Kits Store where we carry simple, easy and affordable testing products for common things like total hardness, pH & alkalinity, arsenic, and chlorine (free & total) all the way up to combination test kits like the SenSafe Water Quality Test Kit which offers 2 tests for 14 different water quality parameters. Oh, and just like in our Pool Water Test Kits Store, the Water (Quality) Test Kits Store offers flat rate shipping of just $5.55 per order and ships everything Priority Mail via the US Postal Service — meaning you won’t have to worry about huge shipping fees AND you know you will get your order fast!